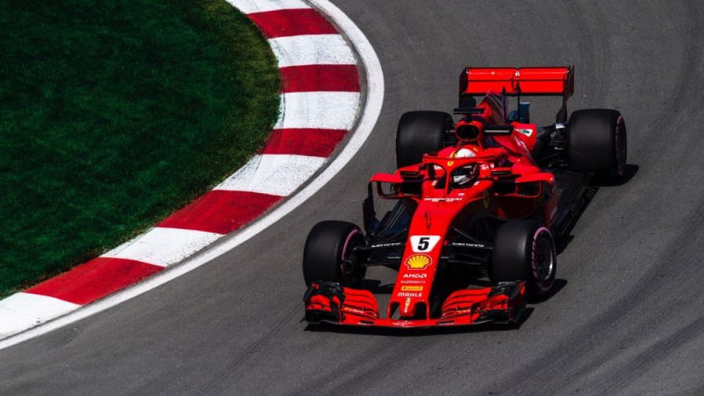 Sebastian Vettel set a new outright lap record at the current layout of Interlagos in third free practice for the Brazilian Grand Prix as Ferrari bared their teeth ahead of Saturday's qualifying – the German over two tenths of a second quicker than Lewis Hamilton. Vettel clocked 1:07.948 – four tenths than Valtteri Bottas' pole time 12 months ago. Ferrari and Mercedes had been locked close together in Friday, but Vettel jumped clear in Saturday's session and teammate Kimi Raikkonen was half a second down. Hamilton's session was not the smoothest, his car routinely smoked out the rear end. Mercedes initially put the issue down to a "dislodged breather pipe" but the newly crowned champion's car still belched smoke after the fix had seemingly been put in place. Valtteri Bottas was in Raikkonen's ballpark in third, while the Red Bulls dropped significantly off the pace in fifth and sixth, after initially lapping similar to the front-runners on Friday. As in FP1 and FP2, Haas took best of the rest honours and Renault failing to lap in the top 10 will give the American side hope of clawing back goo ground in the race for fourth place in the constructors' standings. Stoffel Vandoorne was a familiar presence in last place – the Belgian combatting low-flying birds as well as his wretched McLaren car. VIDEO: Vandoorne hits bird in Brazil practice? !